Any experience working at a National Park- can be life changing, and while I’m a big fan of the Workamping program by at Yellowstone by Delaware North- I wanted to take a minute to talk about the Workamping program at Mount Rainier, since I’m currently located just a few hours east of it! This program is championed by Rainier Guest Services, which operate several properties including the Jackson Visitor Center, National Park Inn and the Paradise Inn as a concessioner for the National Park Service with jobs available in food service, gift shops, lodging, and customer service! Although the park operates year-round their main season, which offers the most Workamping jobs runs from April through October. They have a team of over 240 employees each season, that help to provide visitors with exceptional experiences and create wonderful memories. 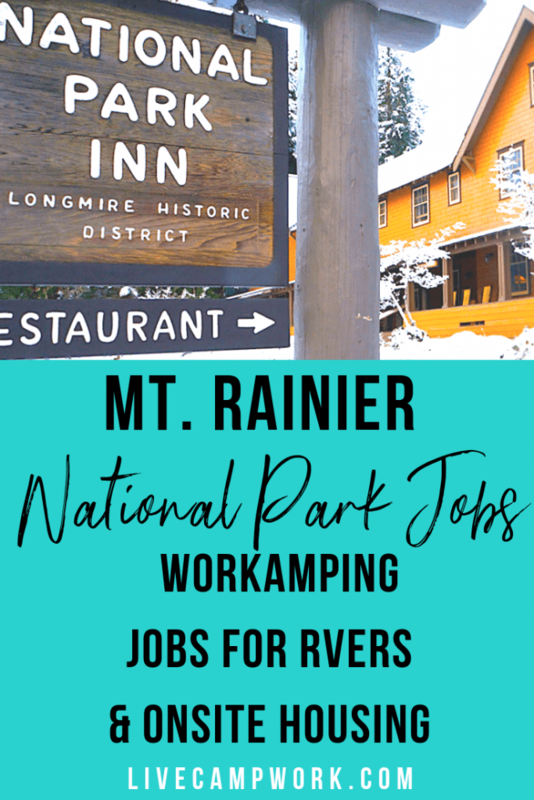 As part of the Workamper team at Mount Rainier National Park, you’ll have the opportunity to really enjoy the surrounding area during your stay in Washington state! Since large parts of the property are surrounded by National Forest, it really provides some exception recreation right outside your doorstep including exploring the Colombia River Gorge, Mount St. Helens National Volcanic Area and the entire Puget Sound region which holds awesome tourist attractions including the Space Needle and Pike Place Market right in Seattle! If you love the outdoors and can deal with being over 60 miles from a major city with limited modern services than Workamping at Mount Rainier might be for you! Employees are welcomed to live and work in a rustic mountain setting where cell phone signals are literally non-existent and wi-fi is slow at best. Opportunities to explore the area are a huge draw for this Workamping job, with outdoor experiences that seem almost limitless. With the tallest volcano as well as the most glaciated peak in the continental United States, Mount Rainier draws in an incredible amount of families, hikers, photographers, and nature lovers from all around the world. The main Workamping season runs from mid-April through min-October. They hire for a variety of different positions, which are all listed in detail on their website. All Workampers are expected to work a variety of hours and days, but in general schedules will include weekends and holidays. Schedules are not guaranteed, nor or the amount of hours per Workamper- but you can expect to work between 35-40 hours per week. When applying for a position, you will provide information on when you are able to start work and when you will need to leave. These dates will play a large part in the HR teams’ decision on whether they are able to offer you a position to join the Workamping team, so make sure the information you provide is as accurate as possible. If you are available to Workamp for the entire season you might have a better chance of being hired than those who are only available for smaller time frames. Benefits of Workamping at Rainier Guest Services include an employee discount inside the retail locations as well as several scheduled employee events throughout the prime season. Full-time RVers will greatly appreciate the benefit of being provided with FREE laundry facilities, which is a big plus in my book! Committed to providing a drug-free workplace, you will be both- drug tested once you arrive as well as subject to random drug testing throughout the Workamping season. Failure, will result in termination of employment. RV sites are offered at two specific locations while Workamping at Mt. Rainier, both offering 30amp hook-ups. One location is inside the park and offers a wooded campground setting, the other is outside the park next to the administrative office and provides a quiet scenic area. Shower facilities and bathrooms are not offered at either location, so all RVs must be self-contained. Longmire Campground is located inside the park near the National Park Inn. This location is a beautifully wooded campground for public guests and holds typically 6-8 Workamper sites. It offers soil pads and includes a laundry facility and Wi-Fi that is about ½ a mile away. Water/Sewer/ and 30amp electricity is available for RVers, but cell service is not available and they cannot accommodate larger model RV units. Cost for the RV site is just $30 weekly for Workampers. Ashford Campground is located just 5 minutes outside the National Park. It offers a quiet, scenic camping experience with 13 additional sites for Workampers. RV sites here, are cement pads that include water/sewer and 30amp electricity. Wifi is free at this location and it also includes a onsite laundry facility. Workampers will pay $60 per week for camping at Ashford Campground. At both locations, Mount Rainier Guest Service allows the presence of well-behaved cats and dogs that are less than 30lbs. They set a max. of 1 pet per RV and all animals must be kept on a leash at all times when outside your RV and cannot be left unattended. Mount Rainier National Park offers onsite housing for those wishing to Workamp without an RV, or maybe those who just want to switch it up and try dorm life! Dorms provide basic accommodations for RVers where several employees will share one room. If you are thinking about applying for a position with Rainier Guest Services to work at Mount Rainier National Park and live in company provide housing, keep in mind that applicants have to be at least 18 years old. There are tons of available positions through the Workamping program by Rainier Guest Services, but I just pulled in some information for a few I thought were pretty interesting. Here are some job descriptions of possible jobs for Workampers that can be found on their website including many, many more! • Retail Clerk: The Retail Sales Associate is responsible for assisting customers in making purchases in a friendly, accurate and efficient manner. The Retail Sales Associate is responsible for merchandising and display, cleanliness, product presentation, receiving money from and disbursing money to customers, and maintaining a high level of customer service at all times. • Housekeeper: The Housekeeper performs routine daily tasks in a safe and efficient manner to clean guest rooms, public restrooms, and public areas of the hotel, including stripping and making beds, cleaning bathrooms, and vacuuming hallways. • Lead Cook: The Lead Cook, under the direction of the Executive Chef, prepares, cooks, and serves food in a three meal per day Dining Room serving up to 1,200 covers per, that are nutritious, safe, wholesome, eye appealing, delicious, and meet recipe and food cost specifications. Perform culinary functions at a higher skill level and efficiency than Line Cook. • Front Desk Agent: The Front Desk Agent must have the ability to perform all desk attendant functions including provide excellent service at the hotel front desk, performing all relevant functions including checking guests in and out, completing reservations, answering phones, coordinating services for guests. • General Manager: The Manager is responsible for all aspects of unit operation and floor management, including merchandise, equipment, and property to facilitate fulfillment of financial goals, company incentives and client standards. Maintain a consistently high standard of guest service, cleanliness, product presentation, and cost control. Supervise Retail Lead and Retail Clerks to ensure tasks are completed in a friendly, safe and efficient manner. • Barista: Provide excellent service in the café by serving coffee, specialty drinks, ice cream, and other food items, completing guest transactions in a friendly, accurate, and efficient manner. Maintain a high standard of cleanliness and product presentation. • Baker Assistance: The Baker Assistant assists in the daily production of specialty baked goods at Paradise Inn including pastries and desserts. Assist Lead Baker by preparing ingredients, following recipes, baking items, and keeping the kitchen clean and orderly. • Busser: The Busser is responsible for assisting the Server to deliver bread, serve water, replenish supplies and assist in maintain the cleanliness of all areas of the restaurant. • Prep Cook: The Prep Cook assists the Cook by preparing ingredients, keeping the kitchen clean and orderly, and by performing some of the simpler cooking functions as assigned according to the menu. • Laundry Attendant: The Laundry Attendant is responsible for cleaning and sanitizing the facility’s linens and guests’ laundry as directed. Operate commercial laundry equipment to provide a daily supply of clean linens and employee uniforms for all park operations. Quickly and accurately sort and fold clean laundry by hand. Assist with check-in and check-out of employee uniforms. Cleaning the offices and restrooms in the Administration building. • Sunrise Lodge is at 6,400 feet. • It can snow anytime of the year. • 60 miles from any major city. • Summer temperatures are typically moderate. • Jackson Visitor Center positions need to be filled from mid-April to mid-October. • Ashford Warehouse positions need to be filled from mid-April to mid-October. • Paradise Inn positions will need to be staffed from mid-May to early October. • Sunrise Lodge positions will need to be staffed from late June to early September. If you are interested in Workamping at Mount Rainier National Park- contact Rainier Guest Services by filling out an online application. Due to the amount of applications received, they cannot guarantee you will be contacted if not a fit for an open position. If chosen to move forward, you will be contacted for a phone interview. Once hired, you’ll receive a Work agreement via email with more details on your position for the upcoming season.